Stirring Trouble Internationally: What If It Was Mitt Romney Who Had Robbed Boston Gas Stations Back In 1999? What If It Was Mitt Romney Who Had Robbed Boston Gas Stations Back In 1999? An interestingly narrated fictional conversation between Mitt Romney and the Gas station incident circulating around the White House. Mitt Romney at the Gas station. 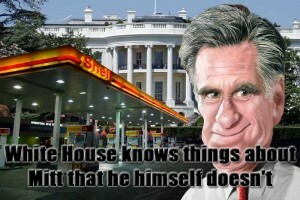 Serious questions are asked about Mitt Romney's past: could he have robbed several gas stations in Boston in 1999?